On todays “standard” Main and Boom Hoists of STS cranes, numerous problems appear when it comes to emergency-stops or sudden power cut-offs. The rotational kinetic energy (inertia..) of the motors can´t be immediately removed – and this energy generates peak overloads to the gearbox against the closed brakes. Additionally, due to the “traditional” dual brake circuits (high speed service brake and low speed emergency brake), damaged bearings, gears etc. occur due to the resulting tooth flank change of the gearing. The high speed service brakes are nowadays not installed for safety reasons – this role has been taken already long time ago by secondary emergency brakes at the rope drums because this brake circuit covers also gearbox failures etc. The service brakes are still in place for a simple technical reason: During normal operation, the motors can accelerate and decelerate the load (motors are acting like brakes) – but when the motor speed is zero, it cannot develop torque in order to hold the load. This is done by setting the service brakes. On E-Stops however, both brake circuits are set because both are “failsafe” and that leads finally to the described problems. In a typical main hoist and as per a sample case study (elasto-kinematic body calculation), the max. occurring torque on the reducer and drive train is about 6.7 times the static load torque (E-Stop down with full speed and empty spreader). The new ISC-HOIST (Inertia Stress Compensating Hoist) incorporates both steps. 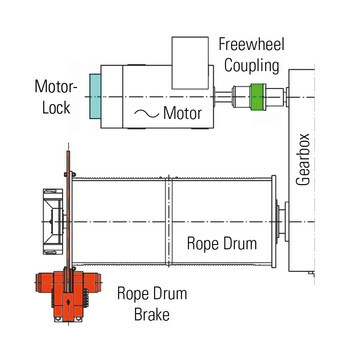 Upon E-Stops or power cuts while lowering the load (worst case), the motors can “idle” through the incorporated freewheels in the motor coupling, thus removing any peak overloads due to their inertia on the drive train. In normal operation, the freewheels are kept closed due to the permanent existing load direction (gravity) – and they automatically open when this load direction is “cut” when the brakes are set. This “first step” solution has been tested and introduced by Malmedie already back in 2016. 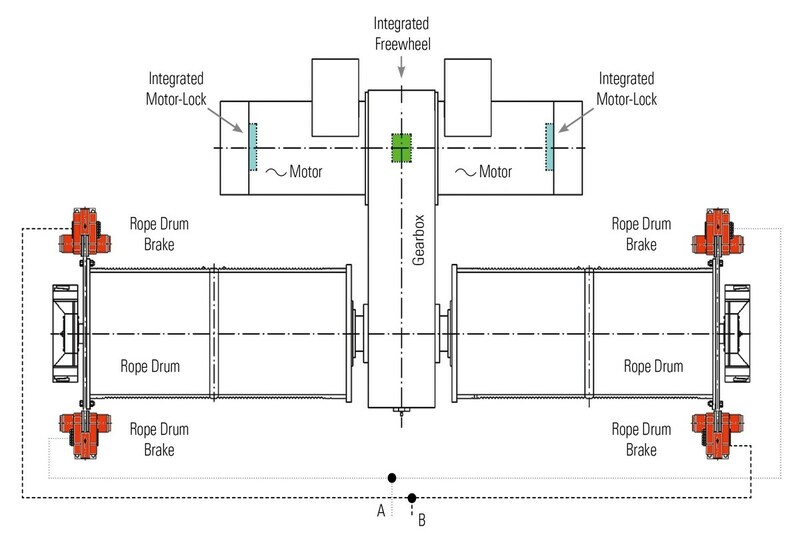 As a layout option, when the freewheel is an integral part of the Gearbox, the motors can be directly connected to the Gearbox, reducing the quantity of components. 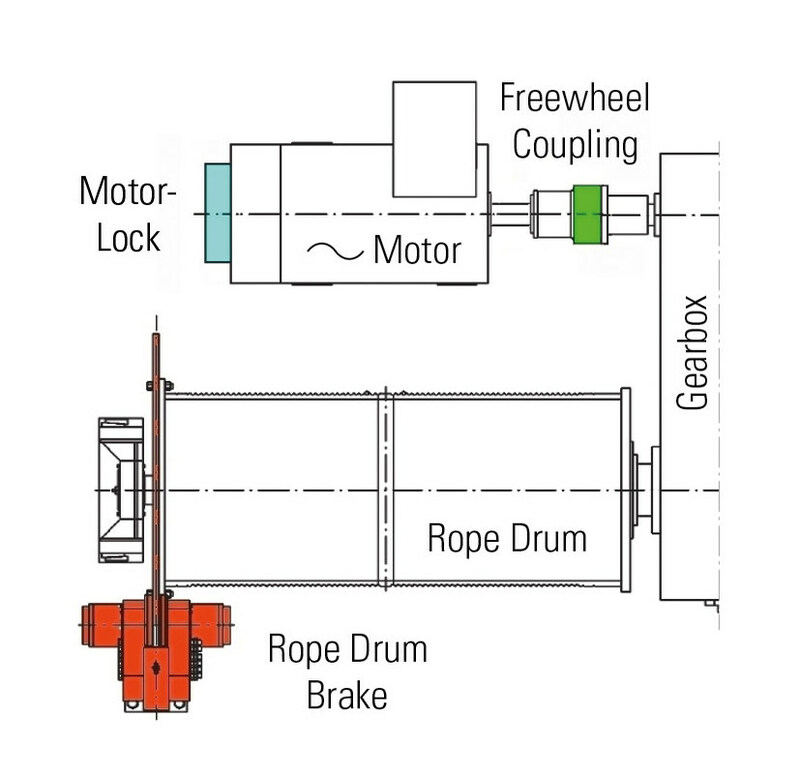 To substitute the service brakes, so called (active) “Motor-Locks”, electromagnetic Gear-Couplings, face geared and with a positive fit are used. The Motor-Locks are normally open (spring released during normal operation), enabling the motors to idle on E-Stops down. Deceleration is done by ramping down the motors itself (…the motor acts as a brake..) – and once the motor speed is zero, the Motor-Lock is electromagnetically set to hold the load. Motor-Locks are small, simple and greasing or any other maintenance is not required. They can be installed at the backend of the motors or even integrated in the motors. Rope drum calliper brakes are still in place to stop the load in case of E-Stops or power cuts or as a result of any malfunction of the system (controlled by speed encoders). Instead of single “big” callipers, dual “small” callipers can be used and operated in two independent circuits alternatively. Alternative Layout with external Freewheel-Coupling and Motor-Lock at the B-Side of the Motor.